Catalonia had in the 90’s 7 credit cooperatives (mainly in rural areas) and 10 Savings Banks (mainly in urban areas). Since 2008, the Spanish financial sector has undergone a significant process of restructuring and. Mismanagement, accentuated by the crisis, successive financial reforms promoted by the government and the bailout by Europe crushed the former Spanish financial system. 1. Disappearance of Savings Banks and therefore cutting the territorial roots of the financial system. 2. Concentration of banks in few hands and decreased banking competition, thereby hurting families, professionals and SMEs. 3. Reduction of staff and offices. 4. Emergence of commercial offices served by agents or financial product sellers (not employees of the organization) and multitask ATM machines (cash management bills, loans). On the other side, banks have prioritised asset management and private banking offices. Workers’ rights have been deregulated. 5. Reduction of resources for welfare projects. 6. Risk of financial exclusion for people with low financial literacy Families, SMEs, self-employed individuals and anyone who wish to undertake new business ventures, have seen their access to financing limited. This is why it makes all the sense to try and reclaim a people’s financial institution rooted in the country and close to users. WHAT ARE WE? WHAT DO WE INTEND TO ACCOMPLISH? Associació per la nova Caixa Catalana Cooperativa de Crèdit is a platform that aims to set up de foundations for the creation of this popular local banking cooperative. It is linked to the work of grassroots civic associations and is a managed following democratic and transparent rules of commitment to the region and solidarity. We are an independent non-profit association devoted to this project. Promoters include small business managers, former workers of savings banks, high level academics and citizens who believe in the project. Self-employed individuals and small businesses. Unemployed individuals wishing to work. Civic organizations, cooperatives and small producers. Companies that employ people with disabilities. Promote patents and cutting-edge technology. Caixa Catalana will not act as an investment banker. It will not induce market speculation in sectors such as real estate. The association is weaving a network of people that are interested in the project to create a new Cooperative Savings Bank, which brings together the diversity of our country. Then, together, we will design the details of the project, taking into account economic feasibility studies, legal and tax advisors. Finally, we will begin the collection of founding capital, with the rigor of a board of trustees. Current legislation allows us to address the European Central Bank directly to obtain a European banking license. Once the license is obtained, the purpose of the organization will expire when we establish the Savings Bank. 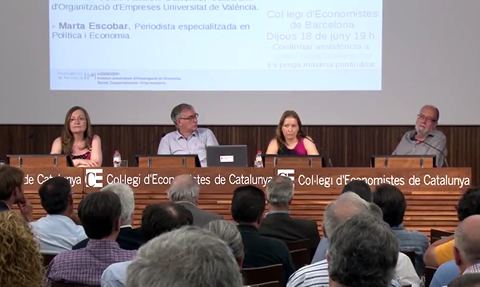 Vídeo from the Association's conference in June 18, with professors Cabasés, Sanchís and Campos. La Associació per la nova Caixa Catalana Cooperativa de Crèdit, NIF G66538000 s'ha constituït amb l'objectiu d'informar i promoure la constitució d'una Cooperativa de Crèdit que, operant en el marc del procès cap a la independència de Catalunya, afavoreixi les classes baixa i mitja de Catalunya. Caixa Catalana, com associació, plataforma d'opinió i pressió, no manté vinculacions de dependència amb cap partit polític ni cap plataforma de poder ni d'opinió. Com puc col-laborar per promoure Caixa Catalana?